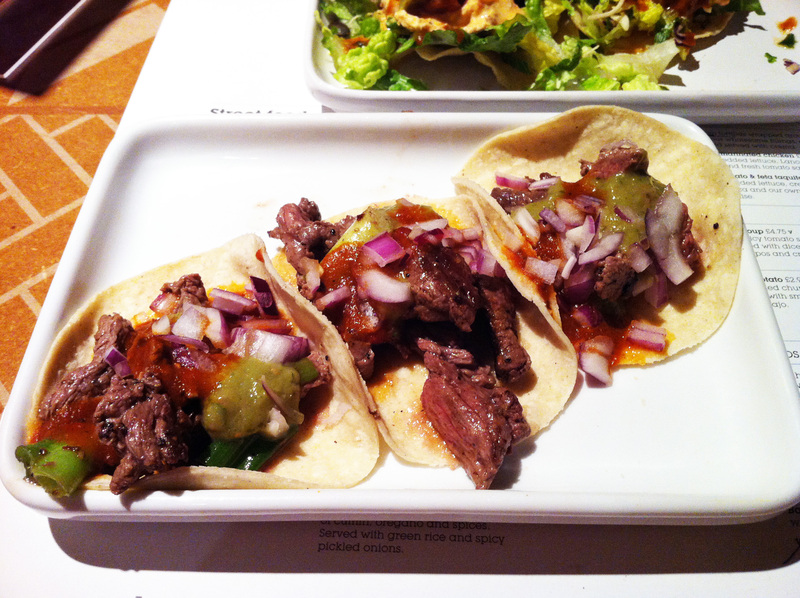 Recently Wahaca has been focusing on street food. The signs outside the restaurants shout it out, the menus are built around it, and they even bring you Street food specials (with 20p going towards street kids in Mexico City). Street food is nothing new. The population of Asia, South America and the Middle East have all been eating food bought from stalls on the road or street for centuries. In fact, there’s even evidence of street food way back in Ancient Rome (because the urban poor didn’t have kitchens of their own). And in truth, we’ve been eating things like sandwiches and pasties in Britain for yonks, too. But street food is now officially designated a ‘hot trend’. And who best to fill us up with delectable dishes, singing with fiery flavours, than Wahaca? 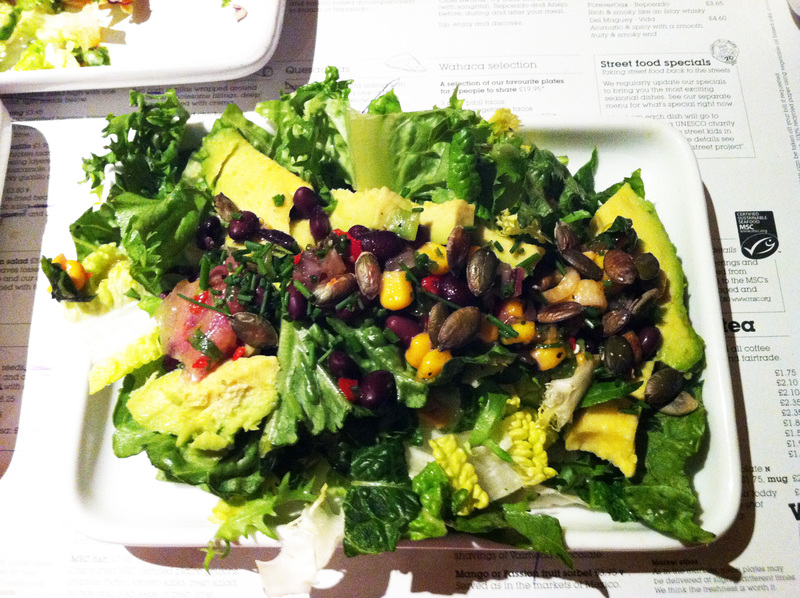 For gluten-free and dairy-free folk, Wahaca is a good choice. I went to the restaurant on Charlotte Street and our waiter was brilliant – he consulted the crib sheet carefully and one by one, went through the menu ticking off what we could eat. He was reassuring and immensely helpful. 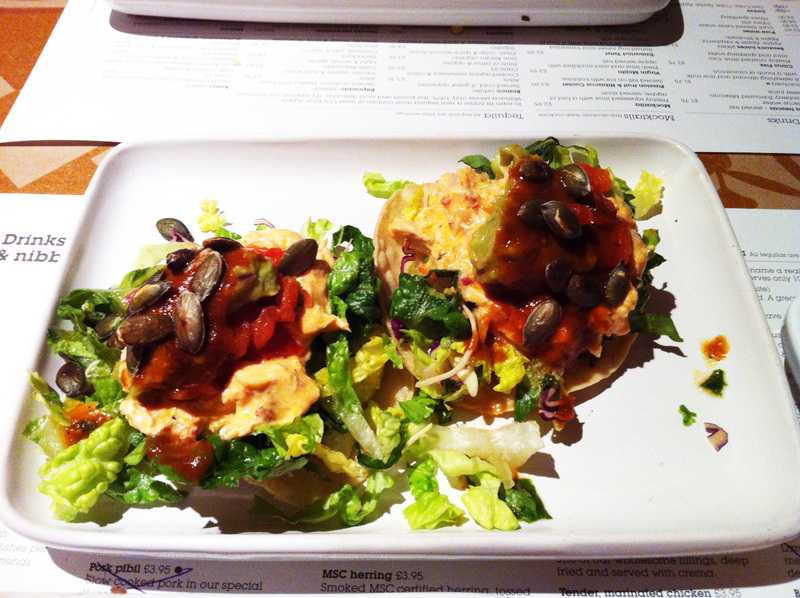 I went for the Chicken Guajillo Tostadas. Two crisp tortillas piled high with chunks of chicken marinated in a chipotle dressing, layered with crunchy salad mix, guacamole, salsa fresca and thier smoky guajillo oil. I’m typing this from the menu but it’s all true. The corn tortillas (and wow, it’s great to be able to eat a tortilla as even the corn ones usually have wheat in them) were crispy, and they were piled high with tender chicken and all the components of this great dish. The freshly-made guacamole was lovely, as was the chipotle dressing, salsa and guajillo oil. This is layers of flavours – all mouth-tingling and full-on. I ordered, too, the Grilled British Steak (yay, British!) Tacos. The menu tells me this is three soft corn tortillas with the steak and chipotle salsa. The steak was delicious – good beef, cooked well, and it was excellent as a follow-on from the chicken, especially because the tortillas were different, as they were soft this time. (And I’m loving the chipotle theme, by the way…) My final choice (as in most sharing dishes places three plates is definitely enough per person) wasn’t nearly as exciting, though. The Corn and Bean Salad had good ingredients (including pumpkin seeds) but the sum, unfortunately, wasn’t as good as the parts. 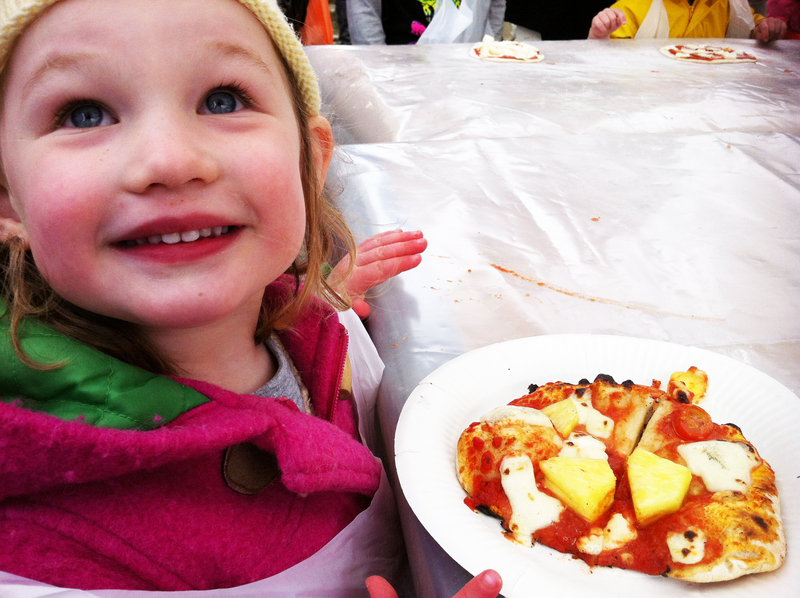 A while ago, I took Zoe to a pizza-making class at our local farmers’ market. 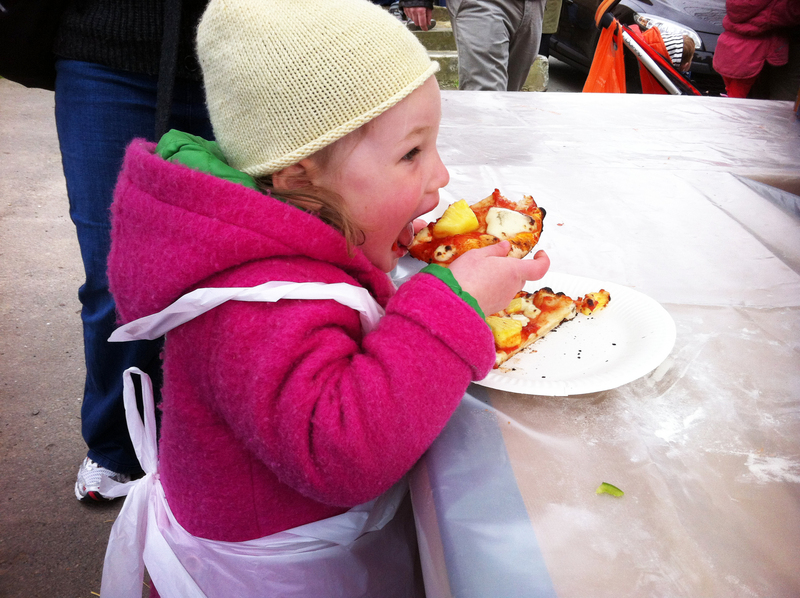 Surrounded by other kids piling on different toppings, Zoe made a very simple pizza, using just pineapple and ham. I asked her whether she wanted to add peppers, tomatoes, mushrooms, or anything else, but she was very clear that she only wanted to add the two ingredients. Of course, it’s a much-loved combination with kids but I was surprised that she didn’t go for the peppers or mushrooms as well. As she munched her way through it – very happily – it led me to think about the beauty of using just a few ingredients in dishes. At home, I often cook very simple meals – baking fish, for example, in olive oil, or grilling meat, and serving it with steamed veggies and salad. If you use good quality (preferably organic) ingredients, you can enjoy every mouthful of pure, unadulterated food. So it makes sense that you can apply the same idea to pizza. This weekend I tried out Zoe’s combo and it was great. Peter, especially, loved it. Long live the good, simple classics! To make the pizza dough, sift the flours, xanthan gum and salt into a large mixing bowl. Add the yeast and, using a metal whisk, mix thoroughly. Add the oil and mix in. Pour in 100ml/3½fl oz/scant ½ cup warm water and, using either a wooden spoon or your hands, mix to form a soft dough. Alternatively, sift the flours, xanthan gum and salt into a food processor. Add the yeast and blend to mix together. Add the oil and blend well. Add 100ml/3½fl oz/scant ½ cup warm water, a little at a time, and continue blending to form a soft dough. Put the dough in a clean bowl, cover with cling film and leave to stand at room temperature for 30 minutes. Preheat the oven to 220°C/425°F/gas 7 and line a baking sheet with baking parchment. Turn the dough out again onto a lightly floured surface and knead a little, then shape it into a ball. Flatten the dough slightly, roll it out into a large circle about 5mm/¼in thick and neaten the edge, using a sharp knife, if you like. Transfer the dough to the baking sheet. 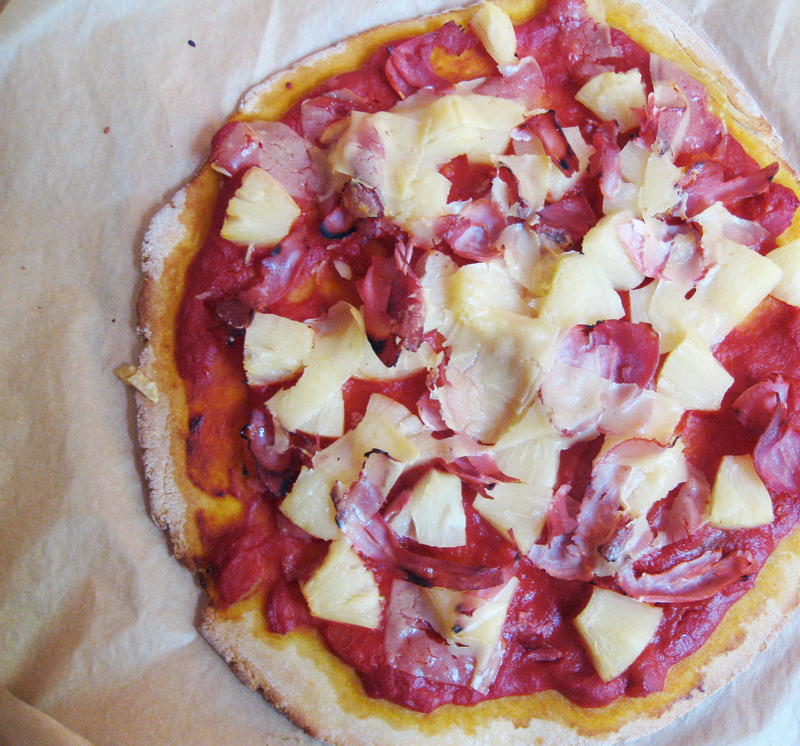 Put the passata and tomato purée in a bowl and mix well, then spread it over the pizza base and sprinkle with the pineapple and ham. Bake for 12 minutes until the base is starting to turn brown and the tomato sauce is bubbling. Remove the pizza from the oven and scatter the cheese over the top, then return to the oven for 3–4 minutes until the cheese has started to melt. Serve immediately. 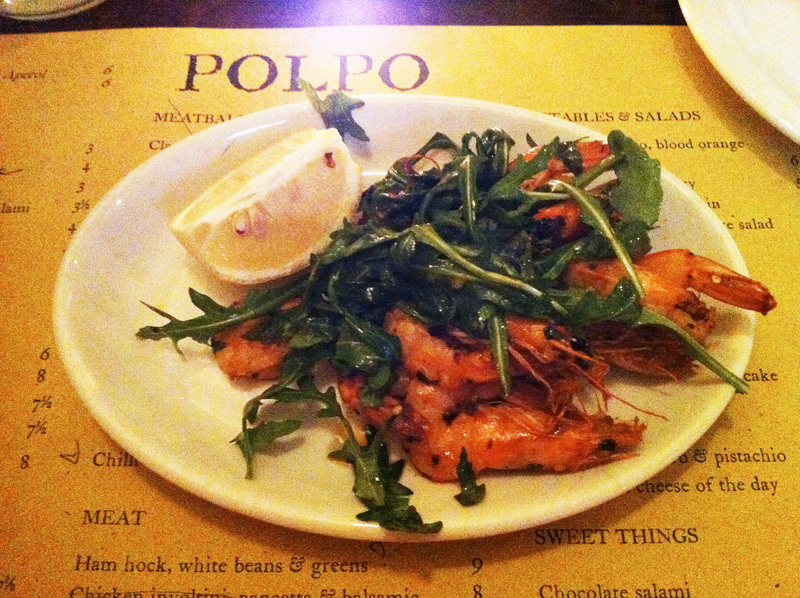 Apparently Polpo is a bàcaro – that is the Venetian word to describe a humble restaurant serving simple food. But Polpo in Soho (and there are two more Polpos – in Covent Garden and Smithfield) is much, much more than that. The Polpo book has just become the surprise winner of the Waterstones Book of the Year prize, beating serious contenders in fiction and non-fiction, including Hilary Mantel. The Daily Telegraph said that the book breaks new territory – and this is exactly what the restaurant did when the Soho Polpo was opened in 2009. 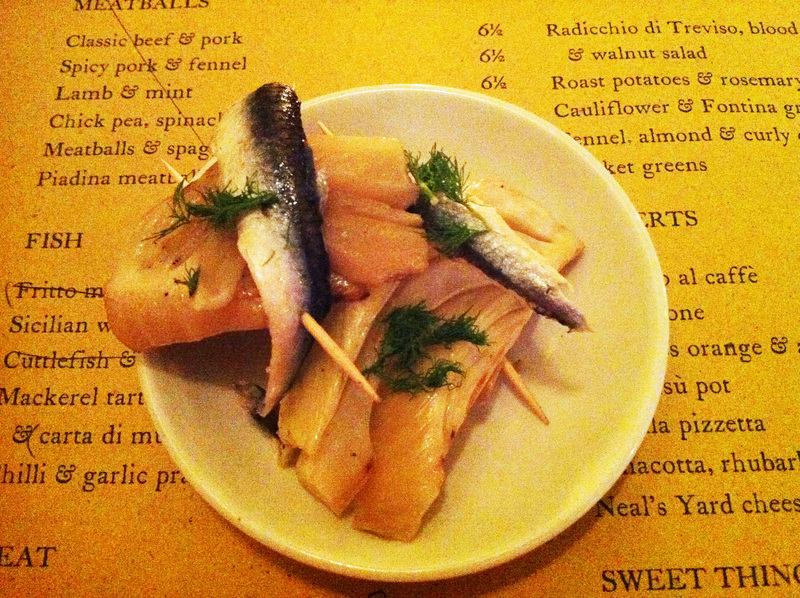 Polpo introduced the concept of small – or sharing – plates. A complete anathema to most British people but it caught on swiftly. You can’t book, which adds to the informality – and the food is simple but innovative. Renown for dishes such as Crispy Baby Pizzas with Zucchini, Mint and Chilli, Scallops with Lemon and Peppermint and Soft-Shell Crab in Parmesan Batter with Fennel, the concept is dishes that are bursting with flavour and immagination. You walk in and the place feels warm and buzzy. The interior is exposed brick and simple wooden tables – and the staff are cool and charming. You’re handed a seasonal-orientated menu printed on brown paper. When I asked about gluten-free and dairy-free, our waiter could not have been more helpful. I opted for the Grilled Fennel & White Anchovy for my first choice. The combination of the fresh anchovies (think soft and mild, rather than the hugely salty and fishy tinned versions) and the rounded aniseed flavours from the fennel were great. So, too, were the Chilli & Garlic Prawns (nothing new but really, really good). But my third selection (and three plates per person is masses), the Ham Hock, White Beans & Greens was, unfortunately, a little bit of a disappointment. 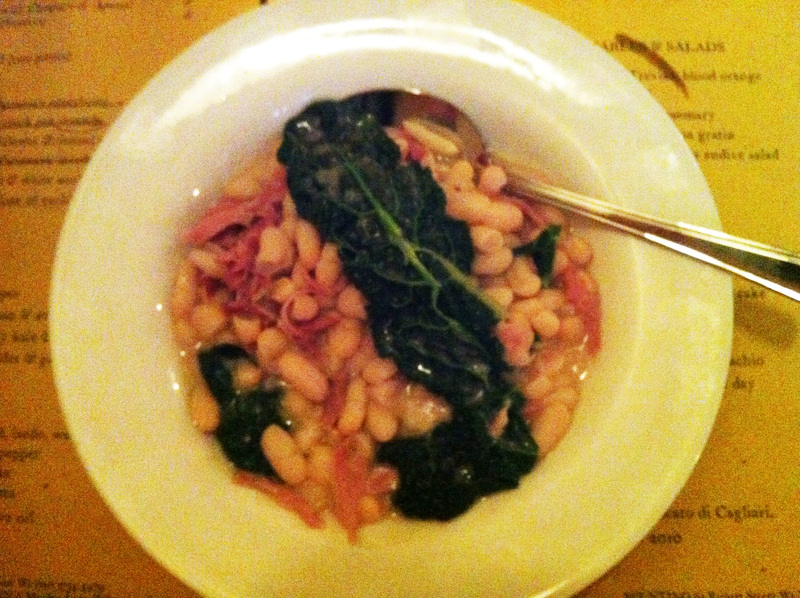 The ham hock was tender, for sure, and there was lots of it, and the beans and greens were well cooked. But, all in all, the dish wasn’t as full of flavour as I’d hoped. But the sense of conviviality was as good as I’d been looking for. I can see that this would be a brilliant place for a date or a night out with friends. Nibbling on shared plates, drinking delicious Prosecco and staying for hours enjoying that age-old triumph of warmth and atmosphere (you don’t get moved on from your table), this place is worth going back to time and time again. Yesterday, I woke up at 4am, pushed the curtains to one side, and took a quick look outside. It was one of those magical mornings, with whisps of morning mist, and all the signs that it was going to be a sunny day. I went back to sleep, thinking ‘I’ll make a picnic for lunch’. And, yep, the sun shone, the birds sang – and, at last, it was time for summery food! Preheat the oven to 180°C/350°F/gas 4 and lightly grease a deep 20cm/8in springform cake tins with dairy-free margarine. Halve the pomegranates and, holding each half over a large mixing bowl, bash the outer skin with a wooden spoon until all of the seeds fall into the bowl. You’ll need to bash the skin a few times before the seeds begin to fall out, but they will. And you might need to pick a few pieces of pith out of the bowl. 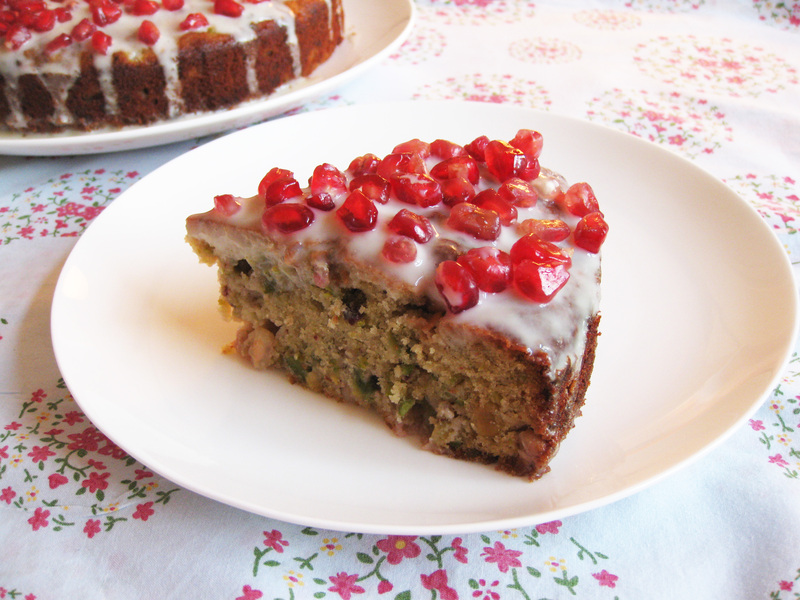 Put a quarter of the pomegranate seeds into another dish and leave to one side, covered in cling film, to decorate the cake. Using an electric mixer, beat the dairy-free margarine and sugar together in another large mixing bowl until light and fluffy. Beat in the vanilla extract, then beat in the eggs, one at a time. Sift the flours, gluten-free baking powder and xanthan gum into the mixture, add the ground almonds, and fold in. Add the pistachios and three-quarters of the pomegranate seeds and mix in gently. Make sure the mixture is well mixed but take care not to overmix it. Spoon the mixture into the cake tin and level the surfaces with the back of a spoon. Bake for about 40 minutes until firm to the touch and a skewer inserted in the centre comes out clean. Remove from the oven and leave to cool in the tins for 5 minutes, then turn out onto wire racks and leave to cool completely. Mix together the yogurt and honey in a bowl until smooth. 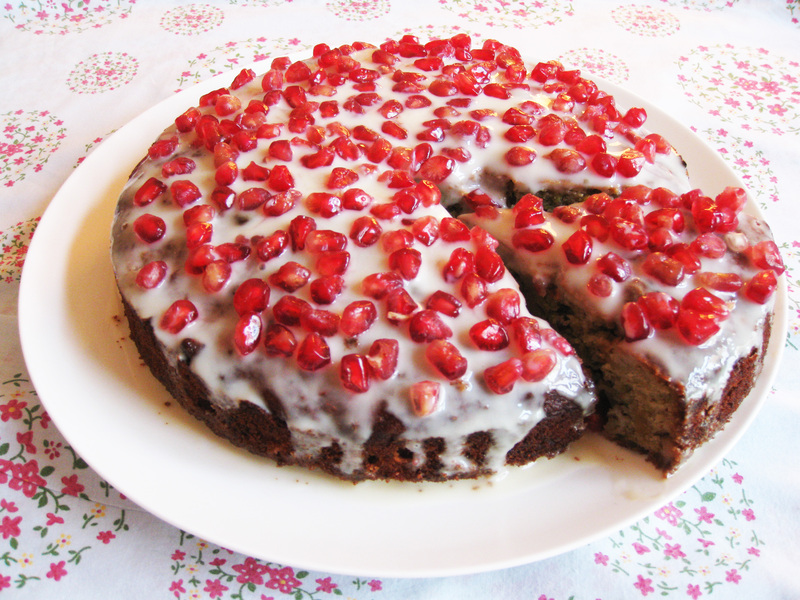 Spread the topping over the cake, cover with the remaining pomegranate seeds and serve. Keep in an airtight container in the fridge for 2–3 days.